Your employees can spend less time worrying about how to track gym attendance, and more time actually working out. IncentFit’s geolocation system uses your phone’s built-in GPS, magnetometer, and other precise sensors to find where you are on the map, anywhere in the world. Your phone’s built-in systems can plot your latitude and longitude coordinates, and even tell us your gym’s street address. We maintain our own records to ensure our data is up-to-date and far-reaching. 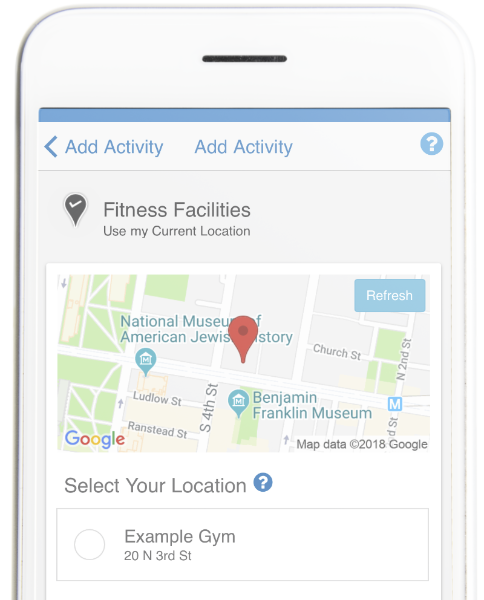 That’s how, when your employees open the IncentFit app, we can automatically log if they’re at one of the thousands of existing fitness facility locations in our database. At a recognized gym? Just open the IncentFit app and check in. New spot? Add a new location and we will review and add to our records after you’ve finished your workout. 12 -Success Phone- (Outline)Created with Sketch. Check out after you’ve completed your workout...cha-ching!